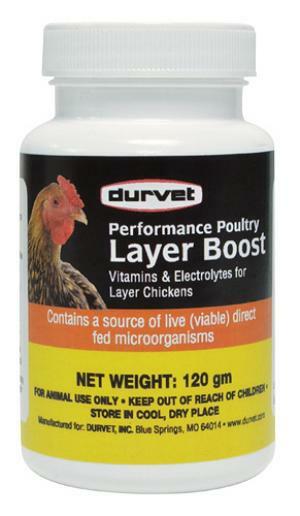 Contains a blend of vitamins, electrolytes, enzyme, omega 3, and tagetes for layer chickens. Layer Boost also contains a source of live (viable) direct fed microorganisms. Contains tagetes to enhance egg yolk color. Contains omega 3 to improve egg quality. Easy to feed. 4gm scoop included-1 scoop per gallon water per day. Ingredients: Maltodextrin, Sodiumbicarbonate, Salt, Dried Aspergillus oryzae fermentation extract, Potassium chloride, Dried Enterococcus faecium fermentation product, Dried Lactobacillus acidophilus fermentation product, Ascorbic acid, Vitamin A supplement, Niacin supplement,Vitamin D3 supplement, Riboflavin supplement, Vitamin E supplement, Flax seed meal, Thiamine hydrochloride, Vitamin B12 supplement, Tagetes. 4 gram=1 teaspoon.